Farrar, Straus and Giroux, 9780374270537, 560pp. This collection of Nadine Gordimer's short fiction demonstrates her rich use of language and her unsparing vision of politics, sexuality, and race. Whether writing about lovers, parents and children, or married couples, Gordimer maps out the terrain of human relationships with razor-sharp psychological insight and a stunning lack of sentimentality. 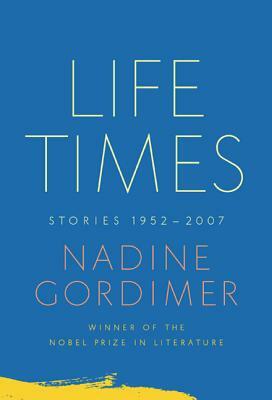 The selection, which spans the course of Gordimer's career to date, presents the range of her storytelling abilities and her brilliant insight into human nature. From such epics as "Friday's Footprint" and "Something Out There" to her shorter, more experimental stories, Gordimer's work is unfailingly nuanced and complex. Time and again, it forces us to examine how our stated intentions come into conflict with our unspoken desires. This definitive volume, which includes four new stories from the Nobel laureate, is a testament to the power, force, and ongoing relevance of Gordimer's vision. Nadine Gordimer (1923-2014), the recipient of the 1991 Nobel Prize in Literature, was born in a small South African town. Her first book, a collection of stories, was published when she was in her early twenties. Her ten books of stories include Something Out There (1984), and Jump and Other Stories (1991). Her novels include The Lying Days (1953), A World of Strangers (1958), Occasion for Loving (1963), The Late Bourgeois World (1966), A Guest of Honour (1971), The Conservationist (1975), Burger's Daughter (1979), July's People (1981), A Sport of Nature (1987), My Son's Story (1990), None to Accompany Me (1994), The House Gun (1998), The Pickup (2001), Get a Life (2005), and No Time Like the Present (2012). A World of Strangers, The Late Bourgeois World, and Burger's Daughter were originally banned in South Africa. She published three books of literary and political essays: The Essential Gesture (1988); Writing and Being (1995), the Charles Eliot Norton Lectures she gave at Harvard in 1994; and Living in Hope and History (1999). Ms. Gordimer was a vice president of PEN International and an executive member of the Congress of South African Writers. She was a fellow of the Royal Society of Literature in Great Britain and an honorary member of both the American Academy of Arts and Letters and the American Academy of Arts and Sciences. She was also a Commandeur de'Ordre des Arts et des Lettres (France). She held fourteen honorary degrees from universities including Harvard, Yale, Smith College, the New School for Social Research, City College of New York, the University of Leuven in Belgium, Oxford University, and Cambridge University. Ms. Gordimer won numerous literary awards, including the Booker Prize for The Conservationist, both internationally and in South Africa.